A tradition of International Education Week, the Global Excellence Awards, presented by the Office of Global Initiatives and the Center for English as a Second Language, recognize three individuals who demonstrate a strong commitment to international education and service. The following individuals were nominated and selected for 2017. Jenny J. Lee has long advocated for international students in all areas of her work. For the past decade, her scholarship widely informed international student access to higher education and their experiences in the U.S. and comparatively abroad. Her current research focuses on international student travel within the African continent, which stemmed from her Fulbright experience in South Africa four years ago. Most recently, she is leading a project to evaluate the newly-established micro-campus model of the UA. Additionally, Lee is a NAFSA Senior Fellow for Internationalization, Associate Editor for the Review of Higher Education and Co-editor of the book series, Studies in Global Higher Education. What are you particularly proud of during your time at the UA? I’ve always been most proud of my students, particularly my international students who I have had the honor to mentor and advise. In many ways, they have taught me as much as I have taught them. What is an important issue to consider for the future of international education? In addition to attempted travel bans in the U.S. against those from Muslim-majority countries, anti-immigrant and anti-international sentiments have become part of mainstream discourse in many societies. With this in mind, it becomes especially important that international education not be reduced to simply more activities abroad, but to thoughtfully consider the “education” taking place within our work. 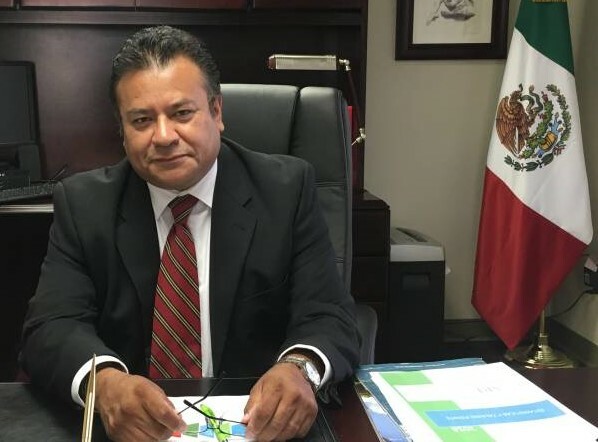 As an ambassador of Mexico’s Foreign Service, Ricardo Pineda Albarran serves the Mexican communities in Pima and Pinal Counties. Beyond supporting human rights and promoting tourism and investment, Pineda is a staunch advocate of the UA. He is known to celebrate the university’s people and programs, and is frequently seen on campus attending activities that promote an enhanced understanding of Mexican culture, politics and economics. Prior to his appointment in Tucson, Pineda established the first Consulate of Mexico in Boise, Idaho and served in leadership positions at the Consulate General of Mexico in San Diego and at the Embassy of Mexico in Washington, D.C.
What inspired you to join Mexico’s Foreign Service in the U.S.? Given the importance of U.S. – Mexico relations and the presence of the Mexican community in the U.S., the opportunity to represent and serve Mexico and its citizens abroad is what motivated my work with the Mexican Foreign Service. What is your favorite part of serving the community of Tucson? I enjoy the ability to help strengthen the relationship between Tucson and Mexico by building bridges in many areas (academic, social and economic) and helping our communities grow. What is an initiative during your tenure in Tucson that you are particularly proud of? More than one initiative, we have been able to consolidate a strong presence in many areas – from the academy, to business and trade – and strengthen our services through the establishment of new offices and the creation of the Center for Information and Assistance to Mexicans. As a Peace Corps Coverdell Fellow, a leader for Arizona TESOL and TESOL International, and a scholar dedicated to the literacy of refugee-background adults, Jenna A. Altherr Flores has a demonstrated commitment to global education. She has provided thousands of hours of service to underserved communities in Tucson, including work as an ESL and literacy instructor for the Refugee Education Program. In addition to teaching, Altherr Flores conducts trainings for community volunteers about how to teach language and literacy to adults from refugee backgrounds. Upon completing her doctorate, she hopes to obtain a position at a research university where she can continue her work. What initiated your interest in language and literacy education among refugee populations? After serving in the Peace Corps as an ESL and literacy instructor and teacher trainer, I returned to the US seeking to continue this type of work with an underserved population in my local community. What is most rewarding about working in the Tucson community? Not only does Tucson have a strong, supportive network of service providers and community partners, but also the resettled refugee population here is very diverse; in my classes, I have taught students from 16 countries who speak a large variety of languages.